Hangoff Helper, the exact clone of the popular Chaser, provides protection from the morning-after symptoms experienced after prolonged or excessive alcohol consumption. Hangoff Helper, the exact clone of the popular Chaser, is a dietary supplement that provides protection from the morning-after symptoms experienced after prolonged or excessive alcohol consumption. 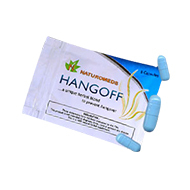 When taken as directed, Hangoff Helper can completely eliminate unpleasant side-effects such as headache, nausea and dehydration. Vegetable Carbon : Vegetable carbon, also known as Activated Charcoal, is an amorphous carbon distilled from materials such as wood, vegetables and coconut shells, materials that provide much larger surface areas than normal charcoal (Certified Natural uses only the highestquality carbon taken from coconut shells). A larger surface area, in turn, allows for greater adsorptive capacity, and the greater adsorptive quality leads to a more effective treatment against the toxins found in drugs and alcohol. Activated charcoal has been implemented for both industrial and medicinal uses. Hospitals use activated charcoal to treat acute poisoning (overdoses) of acetaminophen, salicylates, tricyclic antidepressants and other substances. When overdoses occur, the activated charcoal can significantly reduce the absorption of such toxins into the gastrointestinal tract. Calcium Carbonate : Calcium carbonate is the active ingredient in almost all calcium supplements and antacids currently on the market. The reason for its popularity is due to its availability and the fact that calcium carbonate contains more than double the amount of calcium (38-40%) as most other calcium compounds. Calcium carbonate is found in egg shells and marine organism shells as well as in limestone and marble. It works as a strong antacid because of its nature as a base; it is able to neutralize acids in the stomach, esophagus, and first part of the duodenum, thereby eliminating painful burning in the stomach and chest. If you miss a dose of Hangoff Helper, take it as soon as possible. If it is almost time for your next dose, skip the missed dose and go back to your regular dosing schedule. Do not take 2 doses at once. Store Hangoff Helper at room temperature, between 68 and 77 degrees F (20 and 25 degrees C). Store away from heat, moisture, and light. Keep Hangoff Helper out of the reach of children and away from pets.